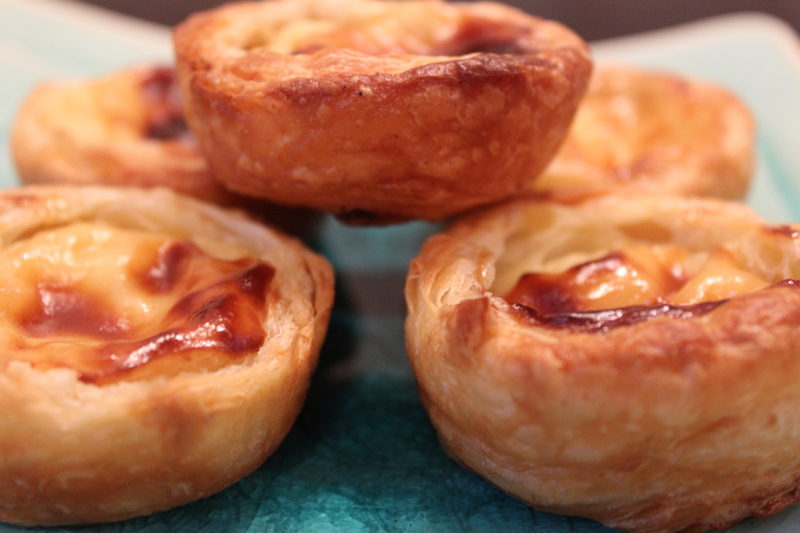 I absolutely LOVE pasteis de nata (or Portuguese custard tarts). 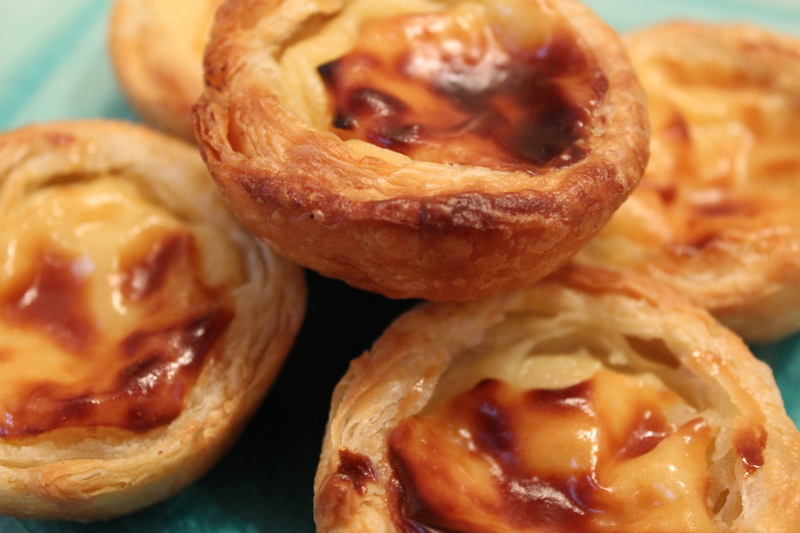 The deliciously creamy, custardy filling with the crispy, flaky, buttery pastry. What’s not to like. I’ve been to Portugal a few times – mainly to the Algarve on family holidays where we enjoyed lovely sandy beaches, sunshine and yummy food. 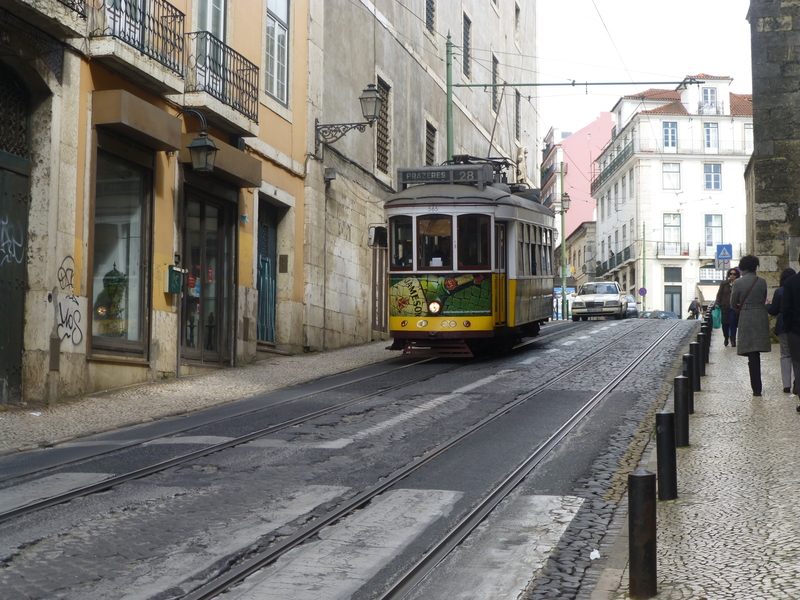 My last trip was a weekend break to Lisbon a few years ago with a really good friend. We met on a trip to Morocco, found out we lived pretty close to each other and have been great friends and travelling companions ever since. Unfortunately for us, the weather wasn’t amazing while we were there, so that put a bit of a dampener (literally) on the place and I think due to the time of year the place wasn’t buzzing enough. It just felt very quiet. 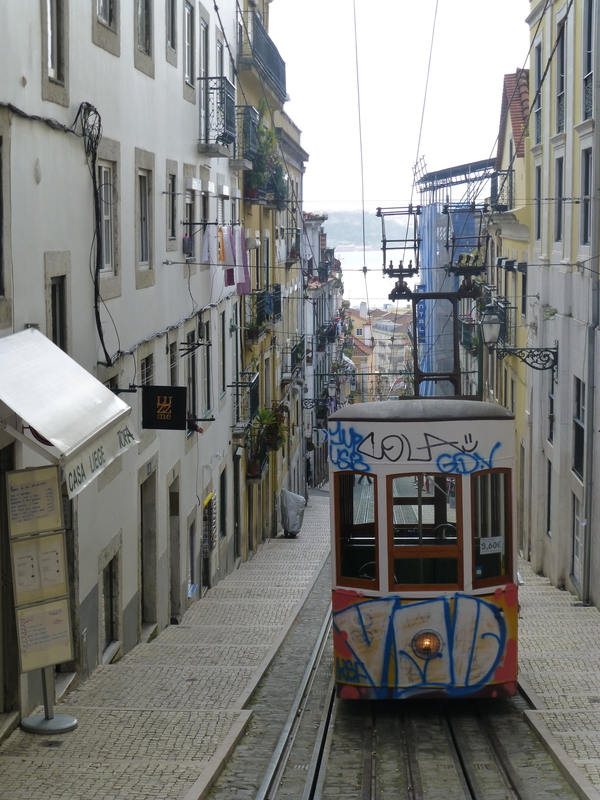 I hate to admit it, but we were both a little bit disappointed with Lisbon, which surprised us as from what we’d heard, we thought we’d love it. I think we’ve both just been spoilt with city breaks and it simply didn’t do it for us at the time. I would like to go back though as there were parts I did really enjoy, and looking back through my old photos I do have some happy memories of the few days we spent there, including the fab bakeries where I could get my fill of delectable delights! 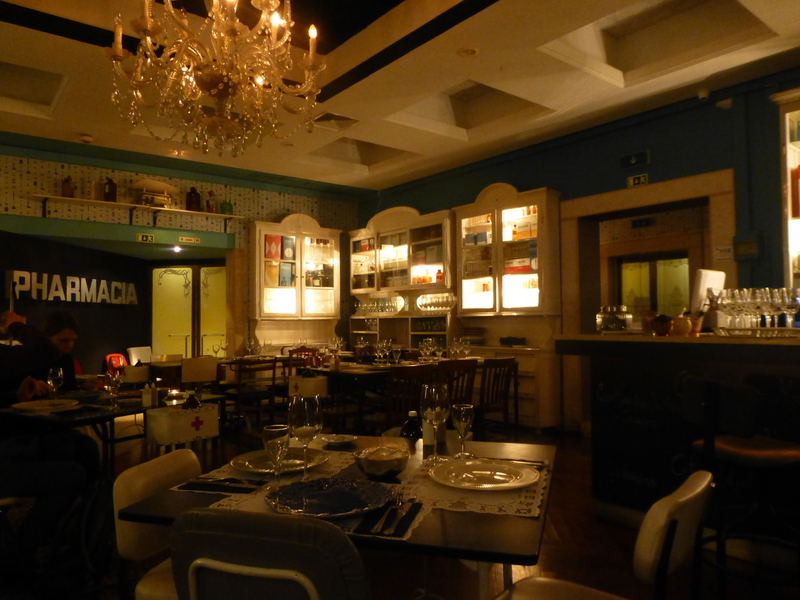 We ate out at a really quirky restaurant located within the building of the Pharmacy Museum called Pharmacia. As you can just see from the photo, the restaurant has a pharmaceutical theme and the whole place is decorated with medical bits and bobs. Mismatched waiting room chairs (at least that’s what they looked like), medicine cabinets packed full of old brown and clear glass bottles, test tubes, funnels, pestle and mortars and even medically inspired wallpaper. Each table had water served in old brown medicine bottles, helpfully marked H2O, and salt and pepper in little medicine pots. Our little taster of soup to start (we had a tasting menu) was served in one of those narrow, tall plastic measuring jugs, which was very quirky, but was a bit tricky to drink and I imagine would be even more difficult if you had a big nose!! We really enjoyed the whole experience. I recommend giving it a try if you’re there. We also loved wandering round the old town, browsing through shops packed full of vintage -style tins of tuna, anchovies, sardines etc, retro packs of soaps, pâtés and loads of other little trinkets. 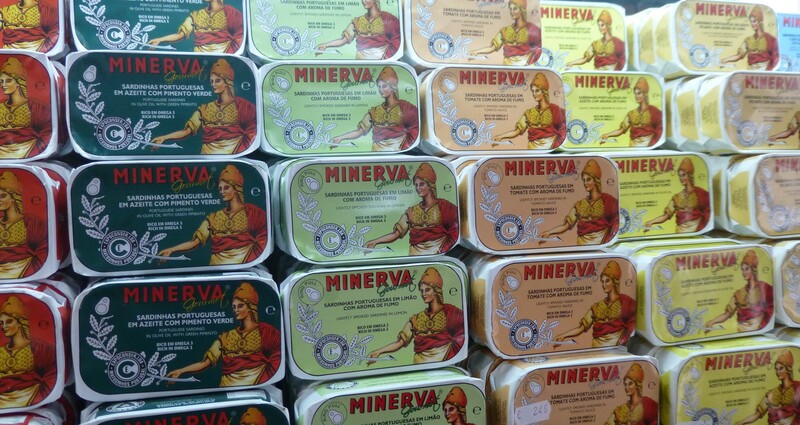 It was very difficult not to come away with loads of tins of sardines (which I knew I’d never eat)! We obviously had to travel the length of the Tram 28 route – which no trip to this city is complete without. We screeched and trundled our way through the old, cobbled streets of Lisbon and ended up at the gates of the Cemitério dos Prazeres (Cemetery of Pleasures), the final resting place of lots of rich and famous Portuguese. We decided to have a look round, before heading back to the city centre. Some parts of the cemetery were in need of repair, and some of the mausoleums looked a bit like they had been broken out of rather than broken in to. 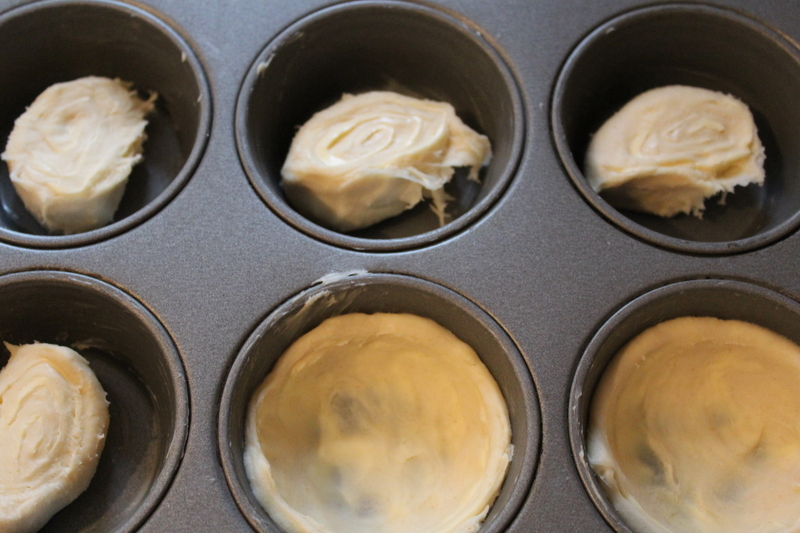 To make the pastry, dissolve the salt in the water. Mix the flours, 15g of the softened butter and water into a dough. Knead for 2 minutes. Form into a ball, cut a cross on the top with scissors, wrap in clingfilm and chill in the fridge for 30 minutes. Heat the sugar and hot water in a saucepan. Simmer for 3 minutes. Leave to cool slightly. Whisk the flour and 150ml of the milk in a saucepan until smooth. Whisk in the rest of the milk, egg yolks, lemon zest, cinnamon and finally the sugar syrup. Place over a low heat and cook for 12 to 15 minutes, stirring regularly until the custard thickens. Give it a good stir, remove lemon zest shavings, pour into a measuring jug, cover the surface with clingfilm to prevent a skin forming, and leave to cool. Roll the pastry into a 17cm square. Flatten the cold butter (I found putting the butter between greaseproof paper (clingfilm would also work) and whacking it with a rolling pin worked) and then place on top of the dough. Then wrap the dough over the butter and roll into a 30 x 15cm rectangle. Fold the bottom third over the centre, cover with the top third and give it a quarter turn. Roll a second time and fold again. Sprinkle with flour if some of the butter comes out. Chill for 30 minutes. Roll out into a 30 x 15cm rectangle, fold as before, give it a quarter turn and roll again into a 35 x 15cm rectangle. Spread the rest of the soft butter evenly over the top and roll (like a swiss roll) starting from the shorter edge to obtain a 15cm plump roll. Spread any butter left on your hands on the outside of the roll, wrap in clingfilm and chill for 30 minutes. Preheat the oven and oven tray to 250C/500F/gas mark 10. Holding the roll with both hands, gently squeeze and pull into a thinner 30cm long roll then cut into 12-15 1.5cm pieces. 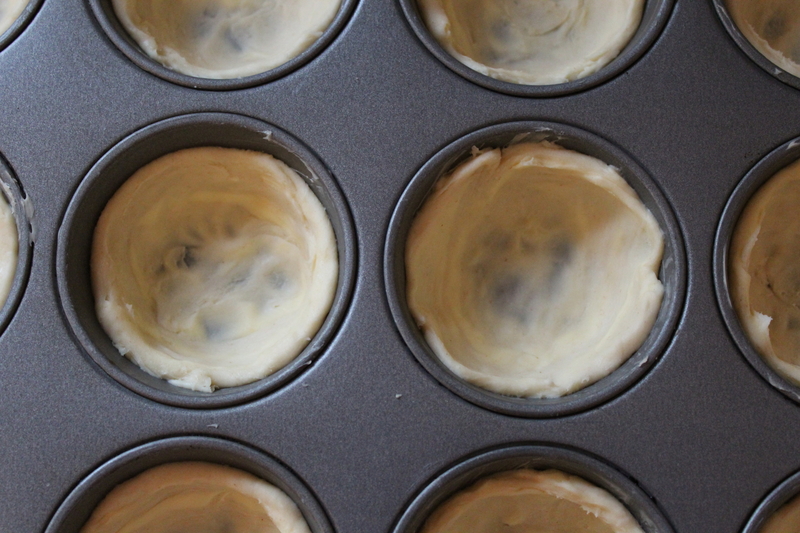 Spread each piece, rolled side upwards, evenly over the bottom and half way up the sides of a buttered muffin tin to form thin tartlet bases. 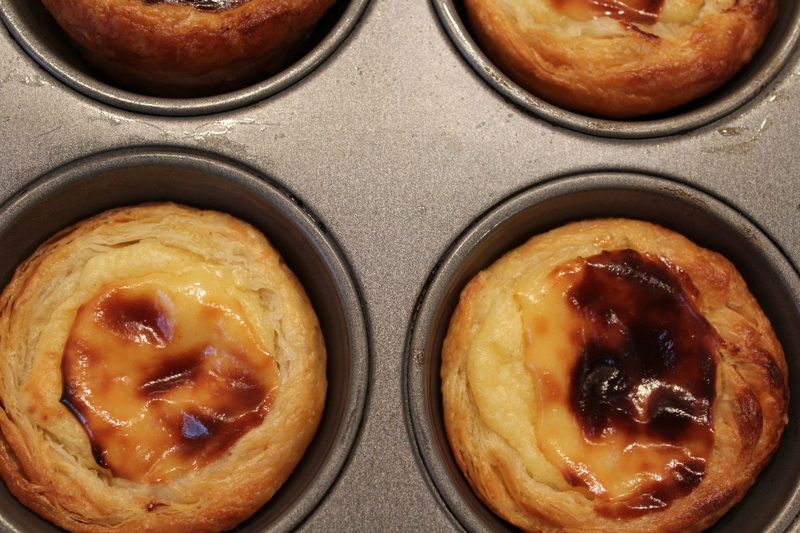 Fill each tartlet with the custard mix, place on the preheated oven tray and bake for 15 to 18 minutes. Cool for at least 30 minutes and serve with a dusting of cinnamon or icing sugar if you like, or just as it is! Not to blow my own trumpet, but I was incredibly impressed with these – and my baking skills 🙂 They turned out amazingly well, and the pastry was sooooo flaky and crispy and delicious. Very chuffed that I can tick off having made puff pastry from scratch AND that it worked and tasted yummy!! Result. Totally yummy, even the next day!